Clicker Connect is a very powerful tool for constructing sentences and telling stories through the use of words, phrases and imagery. It will work best for younger children, but can be used throughout Primary School ages. It comes with a whole host of great examples, and gives users the full freedom to create their own sentence building structures. This app has received an EAS Certification of 5 Stars. Clicker Connect is by and large a tool, but a very well equipped tool. It serves to aid children in learning words, structuring sentences and eventually telling stories through the use of its ‘Connect Sets’. This feature is very powerful and extensible, and is easily what sets this app apart, thanks to its sensible design and wide-ranging abilities. The ‘Connect Set’ is essentially a panel of words which children can use to construct a sentence. This on its own is helpful for vocabulary building, but the multi-faceted nature of the grid pushes this further. A single grid is made up of panels, clusters and cells: a panel is a singular collection of clusters; a cluster is a collection of cells, and a cell is a single word or phrase, readily available for use in a given context. In fact, cells can be made up of text, images or a combination of the two. From the above paragraph, this app may seem a bit more complex than expected. In fact, the first time I opened it, I wasn’t quite sure where to start. Luckily, the app comes with a handy help section to introduce you to the terms and mechanics of the app, along with example connect sets and even a quick start document. These example sets are perhaps the best way to appreciate what this app has to offer, as they provide numerous contexts where the sentence building features come into their own. These include the ‘Retell Jack and the Beanstalk’ grid, which present the user with a panel of images, followed by a series of panels which the child can use to tell the story of each image. In this example, the words are arranged from left to right, with each cluster of words in a different colour, to give the child a general feel to the flow of the story, while giving a choice of words and phrases to allow the child to flex their creativity. 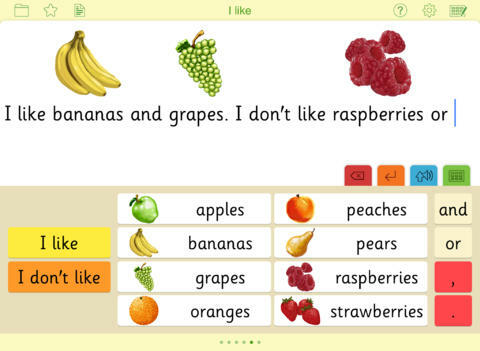 Another example, ‘Food Likes and Dislikes’, uses all of the connect sets’ features to great effect, setting different background colours to distinguish between positive and negative, as well as between verbs, objects, connectives and punctuation. 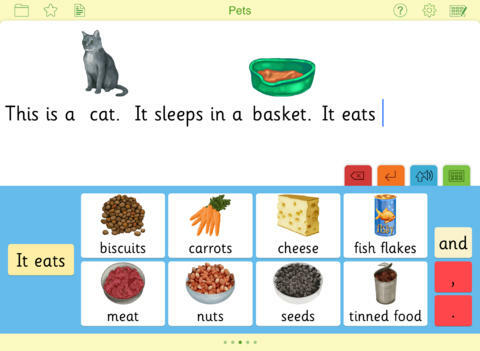 It also uses images connected to the different foods to help children recognise the objects and build their vocabulary, and as the child grows older they can even add their own words using the available virtual keyboard. To help give feedback to the child, as they finish each sentence, it is read back to them, which in conjunction with the use of pictures is a very powerful learning aid. I would recommend that the teacher or parent using this app go through some of the examples, even if it’s just on their own to get a feel for the app, but once they have learnt how to use it, they can create their own connect sets, search through the list of available pictures, of which the app has over 2,500, or use their own photos. In addition to this, they can sign up to the online LearningGrids service to download ready-made Connect Sets created by Crick’s curriculum team, or share their connect sets more personally with Dropbox, WebDAV and Google Drive integration. This app is not one you can give to a young child and leave them to it for the lesson. They will need some help with getting to grips with it to begin with, and the voice synthesis isn’t perfect for some pronunciations. But it’s a tool, and as with all tools, it’s how you use it that makes the difference. Clicker Connect gives you the power and the content to provide a context for your students when it comes to learning literacy skills, and it gives you the help you need to start on the right foot. Clicker Connect is more than just empowering your students to learn – it’s empowering you to teach. 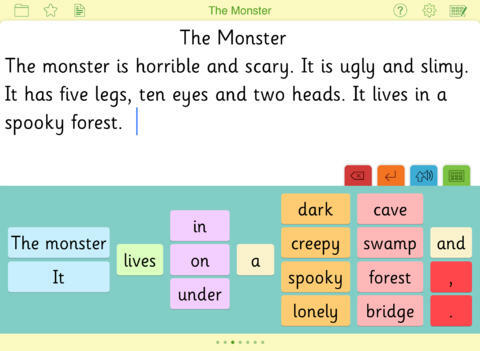 Clicker Connect enables young learners and struggling writers to take their first steps to independent writing by using words and phrases to build coherent text. Clicker Connect is the latest addition to Crick Software’s Clicker Apps family, and is the perfect next step from the widely-acclaimed Clicker Sentences app. 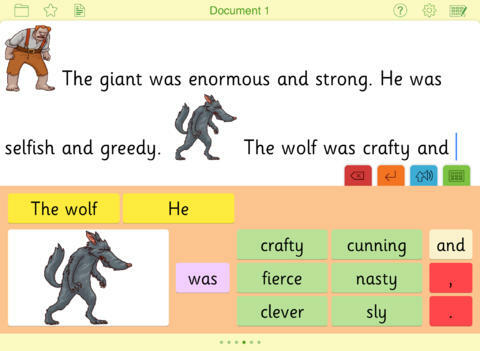 "The app is a triumph because it is based on a simple idea that scaffolds independent writing skills...it kick-starts the writing process, helps children to be creative and gives them a clear sense of achievement." "A fantastic app that bridges the gap between the excellent Clicker Sentences and Clicker Docs"
"This app is a brilliant progression from Clicker Sentences and enables teachers to colour-code parts of speech. Another excellent app from Crick." Pupils choose from clusters of words, phrases and pictures to produce their own writing. As each sentence is completed, it is spoken aloud, helping learners to review and correct what they have written. Learners can listen to words and phrases in the grid before using them, to help them choose how they want to convey their ideas. Set up a sequence of grids for your pupils in seconds, arranging words and phrases into clusters as you go. 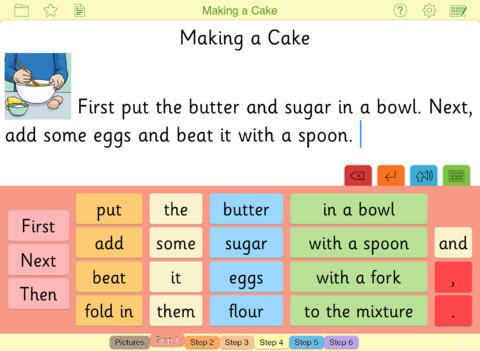 Plus, get free ready-made Connect Sets from our LearningGrids site, which is fully accessible from within the app! For additional support, add a picture to any cell in your grid - over 2,500 searchable curriculum pictures are included, and you can use your own from your photo library or snap them straight in with the iPad camera. As you write, each picture goes into the document too, helping pupils to read back what they have written. - Use the child-friendly keyboard in addition to the grids to extend writing. The child-friendly Sassoon font included in the app makes Clicker documents look great on screen and on paper. Print your work to any Airprint-compatible printer, or share it via email, Airdrop, Dropbox, WebDAV or Google Drive. As they experience success, pupils begin to discover the pleasure of independent writing! Clicker Connect is part of a growing family of Clicker Apps – find out more by searching for “cricksoft” in the App Store.